Ready to set out on the great candy hunt. Home from the adventure. We went a long way, longer than Ben and Clara have ever been before. You can see that Ben was beat but Clara was still as bouncy as when we started. I love the picture of me in the photograph at the top, but it bugs me that the background is my oh-so-unmagical car. So here it is with the background smudged out. I have been all over the place this week, from Virginia to Pennsylvania and back, with little time for blogging, but lots of chances to enjoy Fall color. 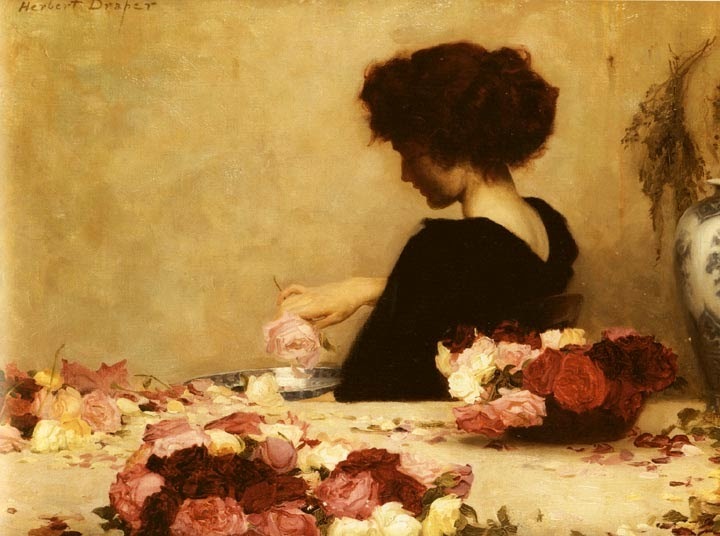 Herbert Draper (1863-1920) was a Victorian painter whose work has seen the same rises and falls in popular esteem as that of his fellow classicists John William Waterhouse and Lawrence Alma Tadema. Around 1900 he was hugely successful, but as modernism came surging on he fell into the ranks of the despised. Lately he has been coming back, as the Tolkien generation seizes control of the art world. 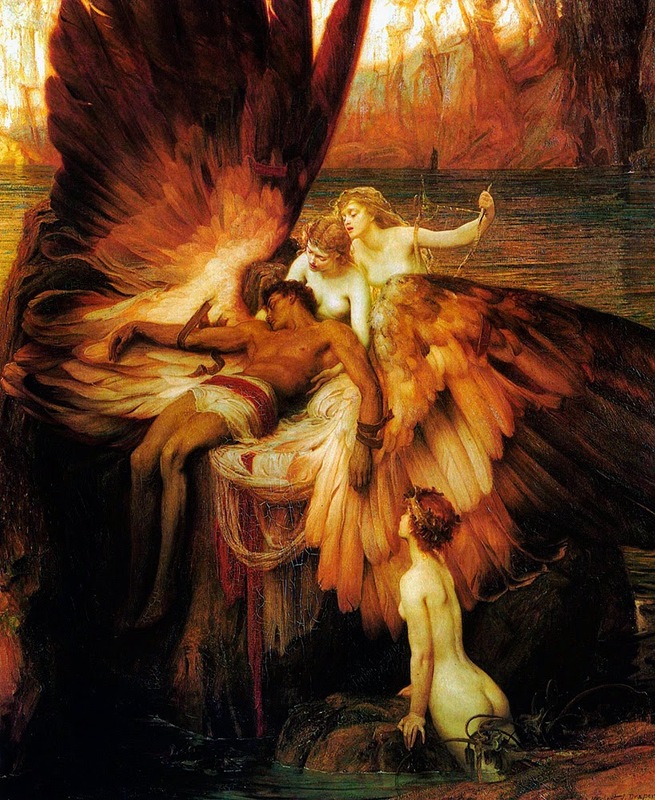 Above is one of his most famous paintings, The Lament for Icarus, 1898. This won the gold medal at the Paris Exposition in 1900, marking the pinnacle of Draper's career. Draper was the son of jeweler, and he was sent to Bruce Castle School in Tottenham and then to the Royal Academy. In 1889 he won the Academy's Travelling Studentship and then spent time in Italy and France. At first he supported himself as an illustrator, but by 1894 he was selling paintings for large sums. Calypso's Isle. 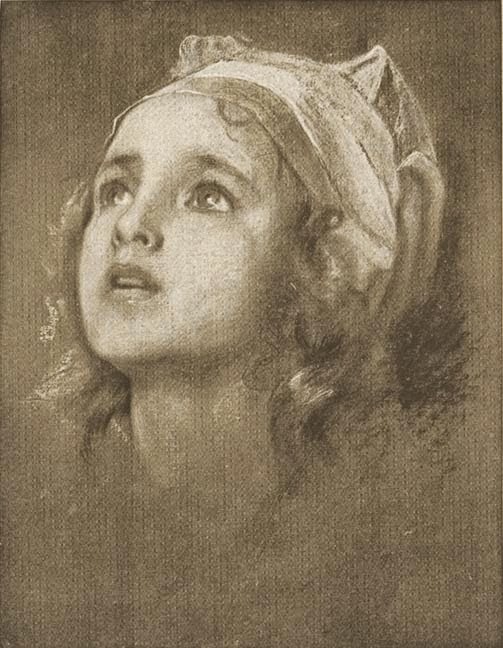 Kelpie, 1903. Yeah, he had a thing for naked goddesses. But what could possibly be wrong with that? 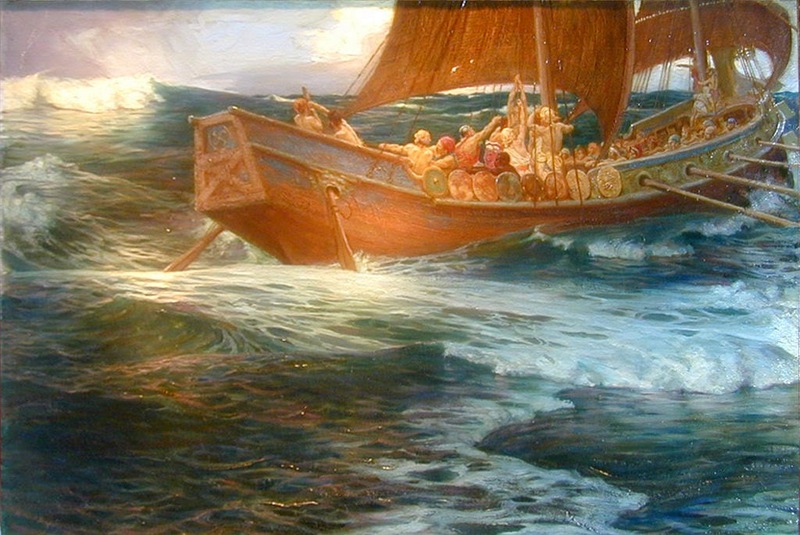 Here's one with no naked women: The Wrath of the Sea God. The Foam Sprite, 1897. This one ought to be the club logo of those Brits who "swim" with dolphins. 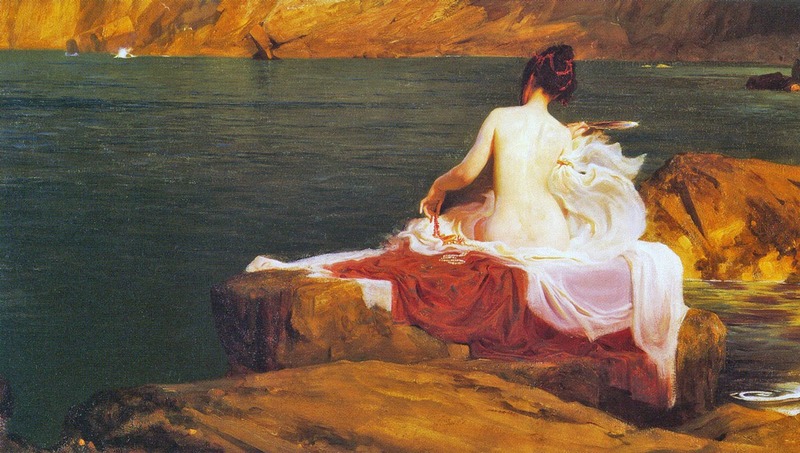 Mostly Draper painted classical themes, but he also did portraits and contemporary scenes. This is Pot Pourri, 1897. 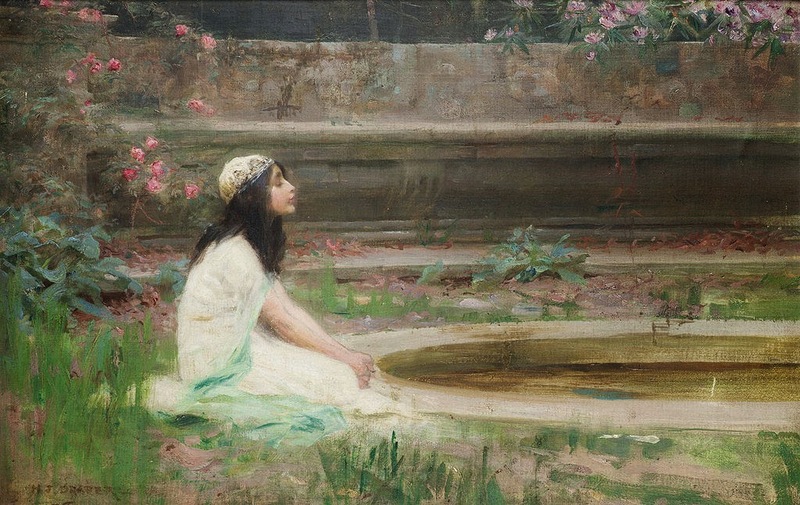 A Young Girl by a Pool. I wish I knew the dates of these, so I could put them in order, but wikipedia doesn't give them and neither does any other source I can find. 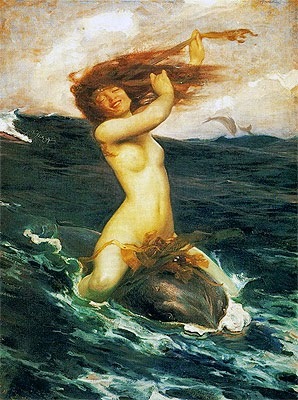 The Sea Maiden. 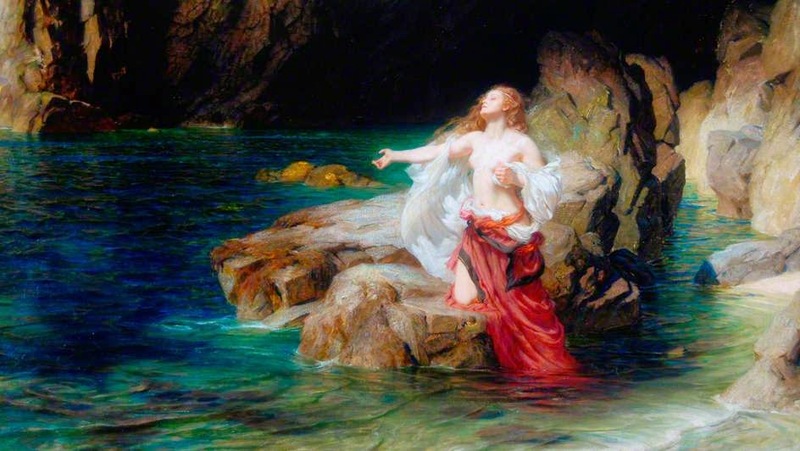 This painting was in the news a few years ago because the Royal Cornwall Museum sold it for $1.34 million to raise money when they were broke. And I don't even like it. Draper also did wonderful drawings. 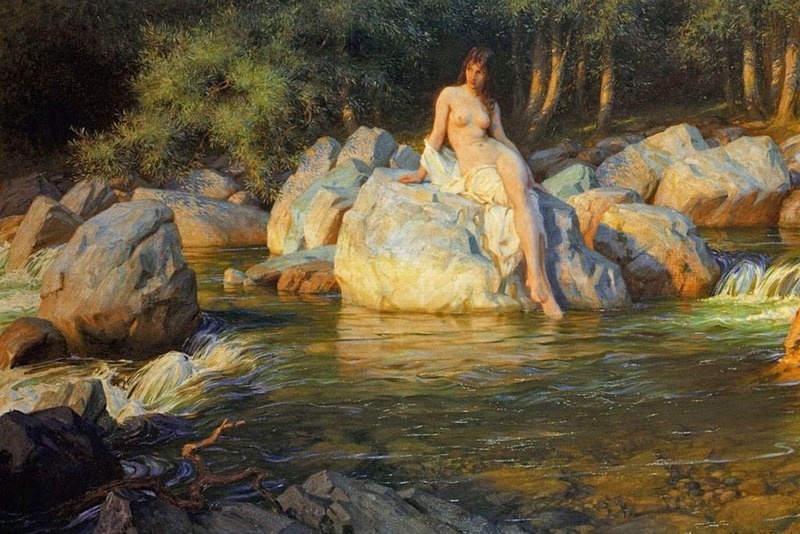 Those I can find online are mostly studies for his paintings, like this one. The Gates of Golden Dawn, 1900. Now that's welcoming in the new century. Tunisia just held the second consecutive peaceful election since its revolution, real cause for celebration given how the Arab Spring has played out everywhere else. The two main parties were Ennhada, always described as "moderate Islamists," and Nidaa Tounes, generally described as "secular." With those descriptions in mind, westerners have generally cheered the victory of Nidaa Tounes. But Nidaa Tounes is a strange party, a mishmash of labor groups, feminists, environmentalists, and hacks from the old, dictatorial regime unified by nothing but opposition to Islamism. Their leader, 87-year-old Beji Caid Essebsi, is an old regime holdover not above accusing all his opponents of supporting terrorism, and some Ennhada activists are worried that he will use that excuse to break their party and arrest all of its leaders. In other words, the competing factions in Tunisia are actually much the same as in Egypt, and there is danger that the same scenario will unfold. So far, though, everyone in Tunisia has been more moderate, and things have been worked out through the democratic process. May they continue to do so for many years to come. 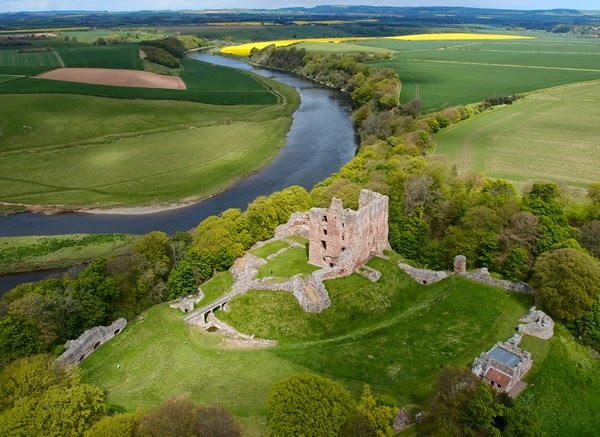 Norham Castle is one of many along the border of England and Scotland, guarding a key ford over the River Tweed. 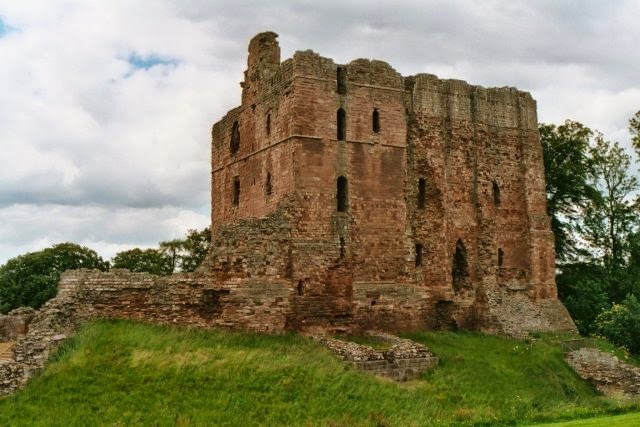 I first learned about Norham Castle doing my dissertation research, reading the Scalacronica by Thomas Grey. Grey was one of England's first secular historians, and the Scalacronica covers the history of the kingdom from 1066 to 1362, the year that Grey spent imprisoned in a Scottish castle with time on his hands for writing. 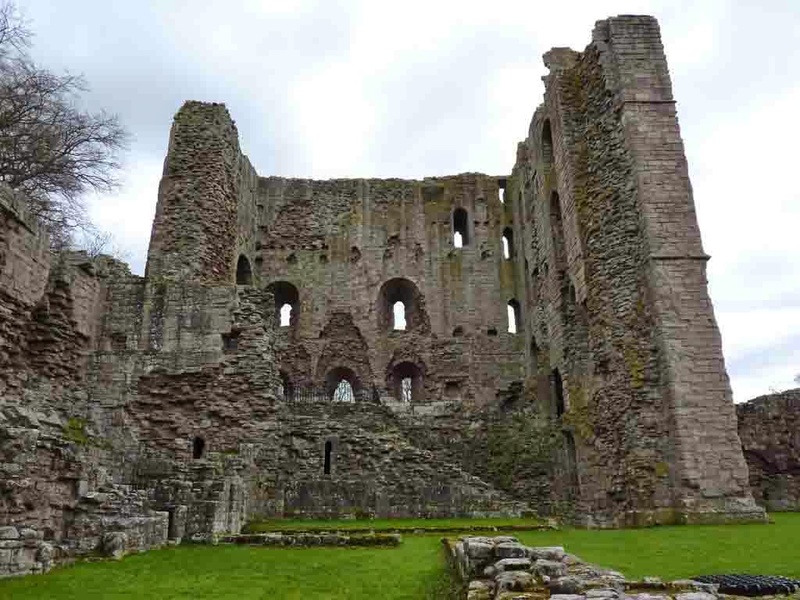 Grey's father was the castellan of Norham in the 1320s. One day a knight arrived at the gate saying that he had sworn an oath to go to the most dangerous place in England to prove himself worthy of his lady. 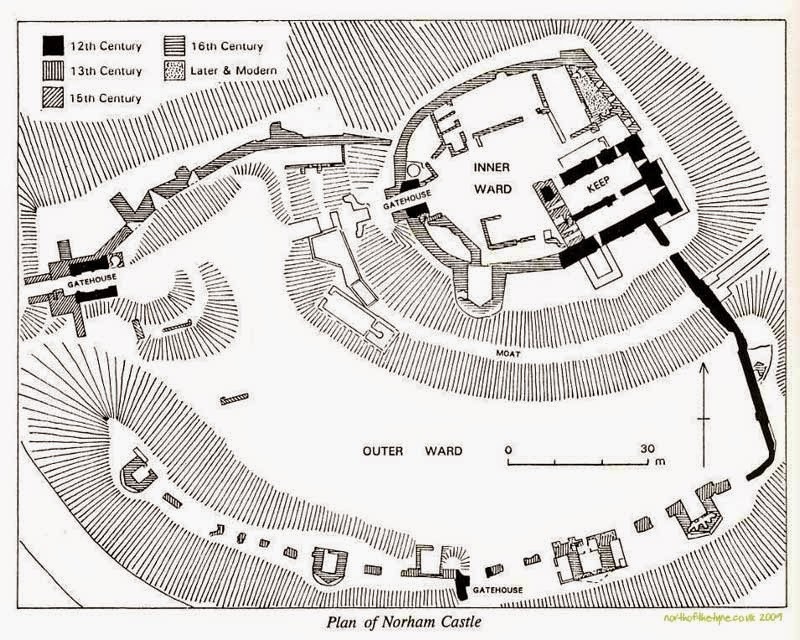 After consulting over the matter, the men in the company agreed that the most dangerous place in England was Norham Castle. So off he went. The knight was welcomed by the defenders of the castle, and they took him along on patrols with them until they met a body of Scottish soldiers and the knight proved his valor by charging them single-handed. He was rescued from this folly by men of the castle's garrison and then went home to claim his lady's favor. If you ask whether that is a true story, all I can say is that Thomas Grey was a pretty accurate chronicler and he said it was true, so I think it is likely to have something of the truth in it. However, a story like that is bound to evolve in thirty years of remembering and retelling, so most likely it is not the exact truth. I like it because I prefer to think that courtly love was not all literature, and that sometimes medieval men did foolish things like the oath of Grey's knight; but others see it differently. Norham Castle built by the bishops of Durham starting in 1121. The mortar was hardly dry before the Scots attacked it for the first time, in 1136. The bishop talked the Scots into giving it back, but they took it again in 1138. The castle was then rebuilt; the great keep that still stands was built in the 1150s. 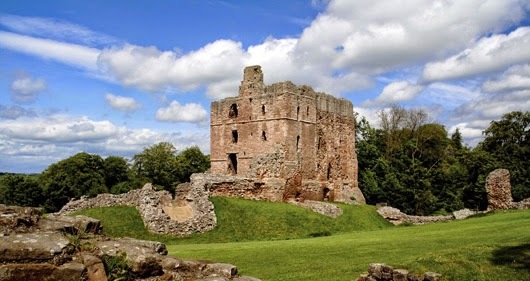 After that rebuilding the Scots besieged Norham unsuccessfully ten times in a row, including a siege of 40 forty days by Alexander II in 1215, and another by by Robert Bruce in 1318 that lasted nearly a year. The Bishops of Durham held the castle until 1174, when they joined a rebellion against Henry II. After he put down the revolt he took the castle into royal hands. So throughout the bloody thirteenth, fourteenth and fifteenth centuries it was the property of the king. In 1296 Edward I left his queen, Marguerite of France, at Norham while he invaded Scotland. During the Wars of the Roses the castle experienced a change of pace and was besieged by English forces, once by the Yorkists and once by the Lancastrians. In 1513 the Scots finally took the castle again, using artillery to batter down the walls. One of the guns they used was the huge Mons Meg, which you can still see at Edinburgh Castle. But just three days later the English routed the Scots at the Battle of Flodden, and the Scots abandoned Norham Castle as they fled home. The castle was extensively rebuilt in the sixteenth century and equipped with its own cannons. After the union of the crowns it was allowed to fall into the splendid ruin you can see today. Representing the ladies of the wine-drinking club -- sorry, I mean the book club. One of two ice-bucket challenge entries. And the Creeper, one of at least three minecraft-themed scarecrows. I think this one gets my nod for runner up. So normal, yet so frightening. This ought to keep the birds out of the corn. Here's an old Halloween friend. Jane in the Box strikes a blow for equality among toys. Zombie Mouse, which I interpreted as a satirical attack on the excessive length of copyright protection. Not sure what this is supposed to be, but something about it grabs me. And a scary fellow to remind us what Halloween is about. Sometimes I can't believe I get paid to do what I do. Like today, which I spent at Fox's Gap on South Mountain in central Maryland. All along the highway the trees were ablaze. It was a gorgeous day, around 80 degrees in the afternoon, likely the last 80 degree day we will have this year. Friendly people up in the Mountains. We were there to shovel test a property that has recently been given to the National Park Service as buffer around the Appalachian Trail, and they plan to demolish the circa 1980 house. Here Mike and Emily dig in the yard. The NPS is a little nervous about destroying the house because it is smack in the middle of the Fox's Gap battlefield, part of the Battle of South Mountain during the Antietam Campaign. Lee had deployed a screen of troops to block the passes over South Mountain while his main forces took Harper's Ferry and Hagerstown. Federal troops attacked on September 14 and drove the Confederates off the crest, advancing into the valley beyond and setting the stage for Antietam three days later. I think this battle was quite important, because it was the first time the Union corps involved had attacked Confederates in a strong position and driven them out. Lee had thought the Federal forces demoralized, so he invited them to attack him at Antietam, thinking he could whip them easily. But instead they fought very hard, hard enough to win a great Union victory if McClellan had not thrown it away with command cowardice at the climax. I think now that a major reason the Union troops performed so well was the boost they got from charging up South Mountain and driving the Confederates off the crest. Driven back from the front, the enemy falling back through Wise's garden, were met by our line coming up from the rear in the flank, and a terrific fight ensued. 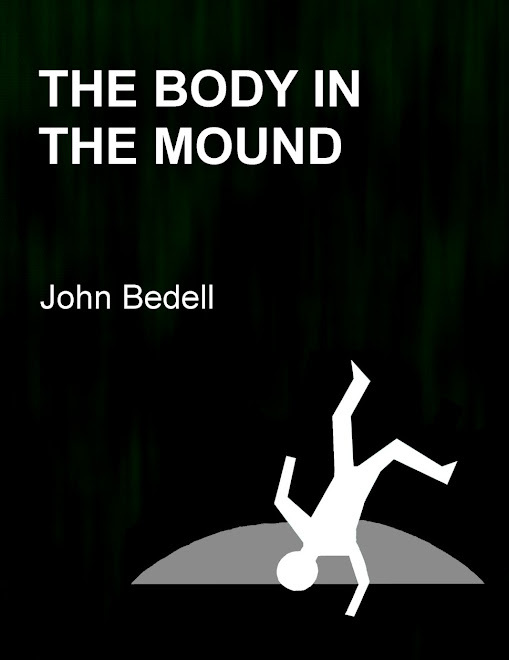 The color bearer of a Confederate regiment jumped up on the rear wall of the garden, and defiantly waving his flag, refused the many calls to surrender which he received, was shot and fell inside the garden wall. Confederate's eye view of the route of the first Union attacks on Wise's Farm. But what we found today was that all the places around the house that may be disturbed when it is demolished were already disturbed when it was built, so no hard will be done to the historic record. Unless you're into preserving ugly houses built around 1980. But not even finding nothing could mess up a day like today. Down by the Potomac Monday afternoon, I heard a bird noise so loud first I mistook it for a flock of geese. 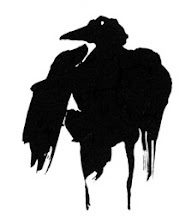 It was crows, at least a hundred, hanging around in the trees along the river bank and all cawing at once. Once I got near the main group it was like standing beside a busy highway. What Does an Ebola Czar Do? What's that Big Gold Thing in Your Bag? How Many Species are Going Extinct? Was Versailles a "Carthaginian Peace"?